Razor barbed wire fencing provides enhanced security and offers a high level of strength and durability. This long-life fencing is designed as anti-climb to prevent scaling. It is otherwise known as Barbed Tape or Razor Wire, and is fabricated with razor sharp steel blades. 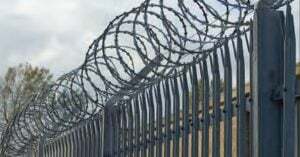 Razor barbed wire metal fencing is recommended for use on high-security sites, such as secure units and prisons, as well as on commercial and industrial properties.